What does the Bible say about drugs? Is it silent or is there some command to avoid abusing drugs? The Bible allows for alcohol, but not for drunkenness. That’s very clear in the Old Testament and the New Testament, but there is a vast difference between drinking and getting drunk. For one thing, if someone’s hurt by a drunk driver, they could lose their license and end up in jail, or worse, if someone is killed, they could go to prison. That’s why drunkenness is a sin, but drinking is not a sin under certain conditions. For example, God allowed for strong drink in some of the feast days or Holy Days, in the Old Testament. At one of the feasts, God tells them to collect a tithe throughout the year, and during the Feast of Booths, after the fall harvest, God tells Israel to “spend the money for whatever you desire—oxen or sheep or wine or strong drink, whatever your appetite craves. And you shall eat there before the Lord your God and rejoice, you and your household” (Deut 14:26), The Hebrew word used for wine in this verse is from the root word, “yah’-yin,” meaning “to effervesce,” “wine, as fermented,” and so by implication, it means intoxicating drink. The Hebrew word for “strong drink” is one word, “Shekar,” and means just what it says; “strong drink,” or an “intoxicant.” Even though God told them it’s “whatever your appetite craves,” this didn’t give them permission to get drunk, and there is no mention of taking “strong drink” during the rest of the year. These feast days were a special occasion. Public drunkenness was forbidden by Israel’s civil law and it is in our laws too. In the New Testament when wine is mentioned, it’s usually referring to the Passover Meal or the Lord’s Supper, so those verses can’t be used as condoning or approving the use of alcohol for Christians, even though the New Testament never commands a Christian not to drink. Getting drunk, yes, that is a sin, and we still see it mentioned in the New Testament as sin. The fact is, anything legal can be abused, but it’s not the alcohol that’s the problem. It is a matter of the heart. The Bible is silent about taking prescription drugs or illegal drugs, but like alcohol, even legal prescriptions can be hoarded and then taken all at once, or they can be sold to others but there is danger in this because they may not have the same reaction as the person who the drugs were prescribed for would have. In some cases, taking other people’s medicines has proven fatal. A life can be lost so quickly…and just to get high for an hour or a few. What price can you put on a human life? What is a soul worth? The truth is we are always in danger of making ourselves the center of the universe (notice I said “we”?). It’s our nature to crave instant gratification, as our parents did in the Garden, after they were filled with the lust of the eyes, the lust of the flesh, and worse yet; the pride of life! That last one gets me. My point is that anyone can abuse prescription drugs…but no one can be 100% sure of how their body will react if the drugs are not prescribed for them. Give the wrong person a drug that speeds up their heart, and it can be fatal! Clearly, a person that’s abusing drugs, legal or otherwise, is not only breaking the civil law, they’re breaking God’s law. Intoxication, no matter what form, always turns out badly. We’re all one heartbeat away from facing God. 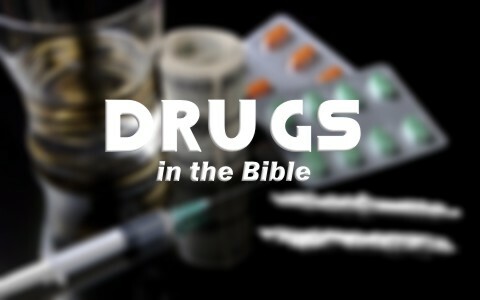 Are Drugs Mentioned in the Bible? The word “drug” is a relatively new word. It’s only been around for a few hundred years, so you won’t find it in the Bible any more than you’ll find the word interstate or freeway, but there is a word that sounds very much like it is a drug. As I said, the word “drug” is not found in the Bible, but that doesn’t mean it’s not in the Bible. In the Book of Revelation we find the word “sorcery” or “sorceries” which comes from the Greek word “pharmakeia.” It sounds very much like the word “pharmacy,” and the word means “the use or the administering of drugs,” and a secondary meaning is “poisoning.” One such use of the word appears in a frightening scenario where “the cowardly, the faithless, the detestable, as for murderers, the sexually immoral, sorcerers (“pharmakeia”) , idolaters, and all liars, their portion will be in the lake that burns with fire and sulfur, which is the second death” (Rev 21:8). To show you the hardness of the human heart apart from God, people are facing serious plagues that are simply devastating the world in the seven trumpets of God’s judgment upon the world (Rev 8, 9), and yet in all these horrific conditions, they did not “repent of their murders or their sorceries or their sexual immorality or their thefts” (Rev 9:21). Again, “sorceries” basically means drugs, so drugs actually are mentioned in the Bible, but just by a different name. You can tell that from the context of Revelation 21:8 and Revelation 9:21, as both of these refer to it as something sinful, much like drunkenness is. The Apostle Paul gives us a great view of the fruits of the flesh and the fruits of the Spirit, and they could not be more different. Among these “fruits of the flesh” are, “sexual immorality, impurity, sensuality, idolatry, sorcery, enmity, strife, jealousy, fits of anger, rivalries, dissensions, divisions, envy, drunkenness, orgies, and things like these. I warn you, as I warned you before, that those who do such things will not inherit the kingdom of God” (Gal 5:19-21). Paul uses the very same word sorcery, which means “drug” (Gal 5:20), and warns that those who practice such things will not be entering heaven (Gal 5:21). A final verse given to the word drugs (“pharmakeia”) is after Babylon has fallen and the merchants are weeping for all their wealth is gone in an instant, where John writes, “your merchants were the great ones of the earth, and all nations were deceived by your sorcery” (Rev 18:23) (“pharmakeia”), however in this case, the secondary meaning for “pharmakeia,” which is “to poison,” seems to fit the context of this chapter much better, so it’s not likely referring to drugs (Rev 18:23). Taking prescription drugs is not sin. Selling them or giving them to others is…and abusing them is, but sometimes, as fallen creatures, we need to take medicines. Jesus said the sick need a physician, and it was very convenient to take Dr. Luke the Physician with them on Paul’s missionary trips. Who better to doctor those who needed a physician than with Luke, but also, who better document the early church’s history of the first century, and record it for us to read today in the Book of Acts? Does this mean if I don’t conquer this horrible addiction, even though I love Jesus so very much, I will go to the lake of fire?? Kelly, no we all are not going to hell if we are battling sin. We should all strive to not sin. If you are in an addiction right now, please seek help and talk to your pastor. Sometimes it takes the prayers of others in your church, even if it’s unnamed prayer request, counsel with a church leader, an accountability partner, but you must overcome this and it takes, ultimately, God’s strength. Please read this article as it will give you practical steps to overcome this at this link: http://www.whatchristianswanttoknow.com/how-can-i-overcome-addiction-and-sin-in-my-life/ Praying for you Kelly. You don’t have to defeat your sins by yourself. GOD will rescue and hold you, and HE does better than i do, and HE loves all. Sir, THE LORD GOD MOST HIGH wants and commands that you repent. Pardon me for this, but i don’t know everything about answered prayers and i’m confused, but i do know that i want to fight against Satan, though i admit that i lack self-control, but Satan is still worth fighting against. Thank you Ashley. Amen. Satan and temptation is worth fighting against.